Public health researchers agree: the evidence is clear that Americans consume way too much sugar, that sugar contributes to weight gain, and that rising rates of obesity in the U.S. will lead to significant health problems in the future. What’s much less clear is what to do about it. In this special, first-ever two-part episode of Gastropod, we tell the story of how sugary beverages—soda, in particular—became Public Health Enemy #1. Why are politicians and scientists targeting soda? Why have most attempts to pass soda taxes failed? And do these taxes even work to reduce consumption and obesity? But can we make them a little less attractive, perhaps by making them more expensive? In 2009, Kelly Brownell, director of the World Food Policy Center at Duke University and Thomas Frieden, then director of the Centers for Disease Control, wrote an op-ed that started a revolution. They suggested that a tax on sugary beverages would be “a key tool in efforts to improve health,” reducing consumption while raising revenue that governments could use to pay for obesity prevention initiatives. “Now, the soda companies will often complain that they’re getting picked on unfairly,” said Brownell. But, while it’s hard to pin down exactly what Americans eat and drink, researchers believe that roughly half of the sugar in the average American diet comes from sugary beverages: soda, of course, but also energy drinks, sports drinks, and sweetened teas, coffees, and juice drinks, among others. What’s more, according to Richard Mattes of Purdue University, these drinks are particularly bad for us because, unlike solid sugary foods, they don’t contribute to a feeling of fullness; people who get their excess calories in soda form are less likely to eat fewer calories during the day to compensate. On top of that, said Harvard researcher Vasanti Malik, the intense burst of sugar that accompanies a quickly gulped can of Coke or Pepsi leads to an unusually high insulin surge, and risks overloading the liver, which breaks down fructose. Both the insulin surge and the liver’s activities can lead to a higher risk of diabetes, stroke, and heart attacks, unrelated to soda’s caloric contribution to weight gain. In the first part of Gastropod’s new two-part episode, Souring on Sweet: The Great Soda Wars, we tell the story of how scientists assembled the case against soda—and then how policy makers tried to act on that data to cut consumption, and how the soda industry fought back. 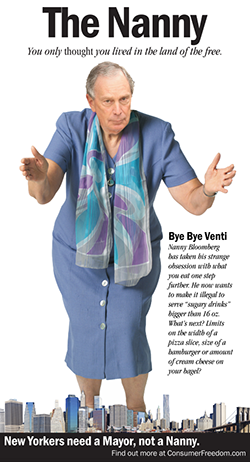 Since 2009, the soda wars have raged, taking up countless column inches and costing billions of dollars, from Jon Stewart’s tirade against “nanny” Michael Bloomberg to the pervasive advertising that links soda to happiness, coolness, and even world peace. Listen in now to follow this epic battle, from New York City’s failed soda portion cap to the defeat of soda taxes at the ballot boxes in dozens of American cities. And tune in again in two weeks for the second part of the story, which picks up in Berkeley, California, with the successful passage of the first modern soda tax in the United States in 2014. In part two of our episode, we’ll answer the question: do these taxes actually work? Is a simple tax the most effective tool, or do labels or other policy initiatives offer more bang for the buck? We have the scoop on all the latest evidence—plus the story of how the soda industry has responded, adopting the tactics of Big Tobacco and even blackmailing an entire state to try to keep soda consumption levels up. Please take our 2018 listener survey here. It’s short, your data will be kept anonymous and only shared in aggregate, and the information you share will help us keep making the podcast and, we hope, keep making it better! We really appreciate it. Julie Mennella‘s research at the Monell Chemical Senses Center in Philadelphia focuses on early childhood experiences of food and flavor preference. Kelly Brownell heads the World Food Policy Center at the Duke University Sanford School of Public Policy. His op-ed with Thomas Frieden appeared in the New England Journal of Medicine in April 2009. Rick Mattes studies dysfunctional eating and its impact on public health at Purdue University, in order to understand the range of influences on why and how we eat, and how those foods are digested. For an in-depth survey of the ways in which soda has promoted its products and fought regulation, Marion Nestle’s Soda Politics is an essential read. The post Souring on Sweet: The Great Soda Wars, Part 1 appeared first on Gastropod.